The last week of the regular season, then 8-0 Brother Rice defeated 8-0 Montini Catholic to be crowned Catholic League Blue Division champions. Given the incredible seasons of both teams (Rice coming off a 2-7 season, Montini making their debut in the conference), it seemed there was no better possible ending to the Catholic League season. 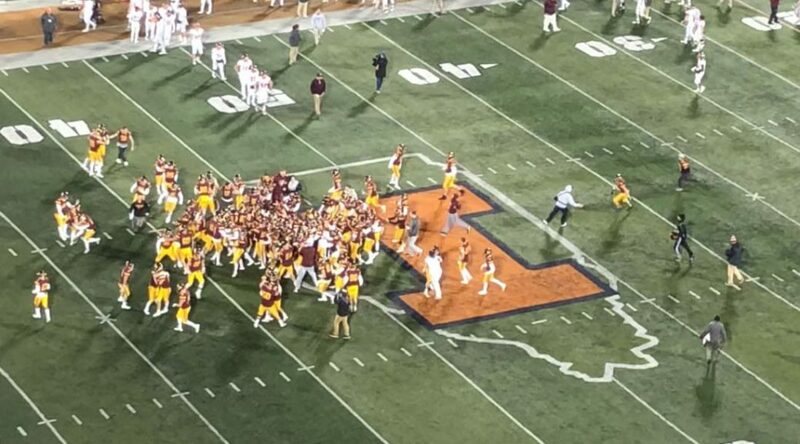 The Loyola Ramblers had other ideas. Having started 3-3, they won their next 11 games capped off by a magical run through the playoffs en route to a 13-3 win over undefeated Brother Rice in the Class 8A State Championship on Saturday night at Memorial Stadium in Champaign. “This is one of the most special seasons of my life, and I’ve been playing football since I was 7 years old,” said Loyola head coach John Holacek following the game. As a former University of Illinois and NFL linebacker and winner of the 2015 Class 8A Championship with the Ramblers, that’s quite a statement for Holacek to make. Midway through this season, it was as if the two teams’ roles had been reversed. After their worst year in school history, Brother Rice were 6-0 and coming off a 21-14 win against St. Rita. Meanwhile, Loyola, who had been to two of the previous three 8A state title games, sat at 3-3 following a loss at home to upstart Montini Catholic. Coach Holacek said that at that point their attitude changed, and that since then it’s like they’re an entirely different team. “We certainly grinded it out, they got better every day, every week because of their faith in and commitment to their teammates, the program and the coaches,” he said. Loyola closed out the season with three straight wins to clinch a playoff berth and were given the 19th seed in the 8A bracket. Meanwhile, Brother Rice continued to destroy every team in their path and completed a 9-0 regular season with a Catholic League Blue Division championship. Brother Rice weren’t used to being favorites, but through the first four rounds of the playoffs they played like favorites, winning every game by double-digits including a semifinal victory over rival Marist. Meanwhile, Loyola in the playoffs embarked on what the players dubbed “the revenge tour,” beating undefeated Oswego, one-loss powerhouse Main South, and defending champion Lincoln-Way East, who hadn’t lost since the 2016 quarterfinals and beat the Ramblers 23-13 in the 2017 8A title game. That brought them to the matchup with Brother Rice, the number-one seed led by All-State quarterback John Bean and a stout defense. It also was the perfect completion to the revenge tour, Loyola having lost to Brother Rice 35-3 back in Week 4. “To avenge 2016, 2017 and earlier this year it’s a storybook ending,” said Loyola wide receiver Artie Collins. As for the Crusaders, the loss was particularly tough in light of how far the team had come. This is perhaps most true of quarterback Bean, who revealed he had played the championship game with a sprained ankle sustained the week before. However, he said that it wasn’t fair to blame the result on his injury. If anything can be taken away from this matchup, it’s to never count a team out. Brother Rice made the greatest single-season turnaround in Illinois high school football history. Loyola won a state championship despite having been written off by most observers months ago. Given how compelling each team’s story was, it’s unfortunate one had to lose this game. While their reasons may be different, for every player on the field Saturday night, this game was the conclusion of a season they’ll never forget.